Astronomers often find themselves studying objects that aren’t visible. To understand the behaviors of supermassive black holes or exoplanets, for example, astronomers need to be clever and devise indirect methods for observing them. For objects like Sgr A*, our own galaxy’s supermassive black hole, one observational proxy might be watching the frantic orbits of stars in the very center of the Milky Way. For an exoplanet, the proxy might be a transit visible in a light curve or a wobble in the radial velocity measurements of its host star. But what can we look for when trying to study some of the first galaxies, dwarfs with low stellar masses that are not bright enough to be directly imaged? Figure 1: The observed LAE-CIV pair at z=5.7. The signal from CIV is located at the position of the black star and the LAE is the red spot to the lower right, while the large grey circles are regions that have been masked. Source: Díaz et al. 2015, Figure 14. In a 2015 paper, astronomers observed two spectral phenomena in close proximity: A Lyman-alpha emitter and absorption from triply ionized carbon (CIV; see Figure 1). Lyman-alpha emitters (LAEs) are large nebulae that emit massive amounts of light at a wavelength of 1216 Angstroms (the Lyman alpha wavelength). CIV absorption, arising from cool gas, can be found in an observational probe called a quasar absorption spectrum (QAS). In a QAS, an astronomer observing the spectrum of a quasar is able to see absorption of the quasar’s light by atoms and ions lying along the line of sight, typically belonging to the circumgalactic medium of some intervening galaxy. That’s all well and good, but who cares if we can see a bright, hot object like an LAE relatively near some cool, diffuse gas? As it turns out, these objects are both located at a very high redshift, corresponding to a time when the universe was only 1 billion years old. This epoch of the universe’s history is notoriously difficult to study because, in addition to being very far away, the majority of galaxies at that time are believed to be small dwarf galaxies with relatively few stars, meaning that they are simply too dim to be visible using modern telescopes. This LAE-CIV pair is important because it gives astronomers an opportunity to determine whether the primary sources of metal enrichment are bright and highly visible objects like LAE, or if the metals are instead coming from invisible dwarf galaxies. In the latter case, absorption systems in CIV or other metal ions would also provide astronomers with a way of studying the as-yet unobservable galaxy population that peppered the early universe. Figure 2: The physical layout of an example LAE-CIV system created in the García et al. 2017 simulations. The LAE and CIV absorber are separated by a projected distance d, which an outflow must traverse if the LAE is the source of the enriched gas. Lying nearby the CIV absorption in the simulation is a low-mass dwarf galaxy that would be dim enough to slip under observational detection limits. Source: Figure 1, García et al. 2017. 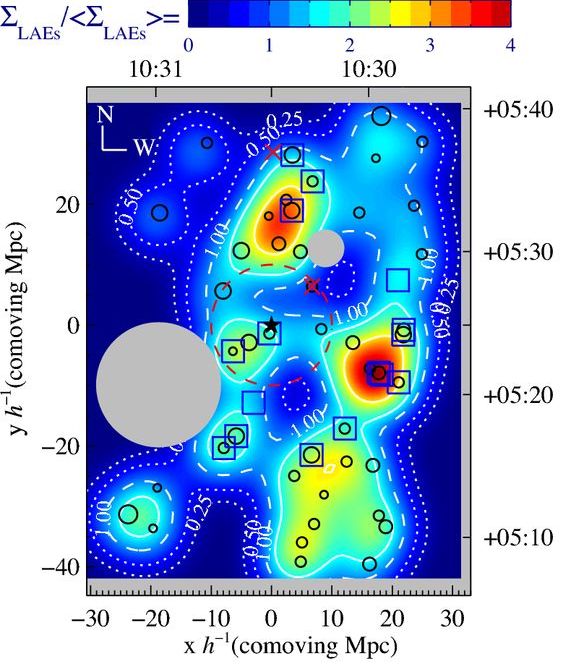 García and collaborators use this LAE-CIV pair in tandem with cosmological simulations to determine what sort of object is causing the carbon enrichment. The initial question that arises is this: Was the carbon contributing to the CIV absorption pushed into the quasar’s line-of-sight by an outflow from the LAE or was it generated by an unseen dwarf galaxy? The authors test this by running cosmological simulations, in which large-scale structure starts to form from a mostly uniform distribution of simulated dark matter and baryons, creating diffuse filaments linking together denser galaxy clusters, complete with a realistic treatment of gas and metals. The authors stop the simulation when the universe is only 1 billion years old, corresponding to the age of the universe at the location of the CIV absorption in the observed QAS. Analyzing the winds generated by their simulated galaxies, the authors find the fastest wind speed in the simulation and calculate whether it is fast enough to blow the CIV into the quasar’s path in a reasonable amount of time. Comparing this velocity to the projected distance between the LAE and the CIV absorption, they find that it would take nearly 1 billion years for any metals ejected from the LAE to reach the location of the CIV absorption, which would require that the LAE was formed only 100 million years after the Big Bang. This scenario is highly implausible, given that our current understanding indicates that galaxies would not have formed fewer than 200 or even 300 million years after the Big Bang. Okay, so the CIV absorption couldn’t have come from the LAE. What then is the likely source of this intergalactic enrichment? 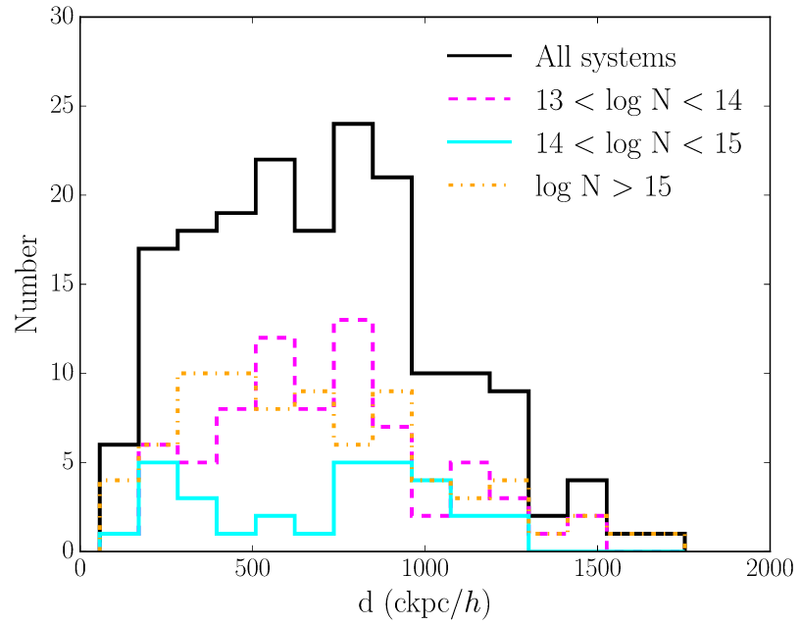 Figure 3: The number of simulated CIV absorption systems as it varies with distance from a “host” galaxy. Absorbers are subdivided into different strengths, measured using column density N (essentially the number of ionized carbon particles in the line of sight). Source: Figure 4, García et al. 2017. In pursuit of an answer, the authors generate artificial absorption spectra from their simulation to find a representative population of CIV absorption systems and find the locations of all the simulated galaxies. They then split the galaxies into two categories, dwarfish and massive. Examining the proximity of the galaxies to the identified CIV absorbers, they found that their CIV systems were overwhelmingly located closer to the dwarf galaxies than the massive ones. 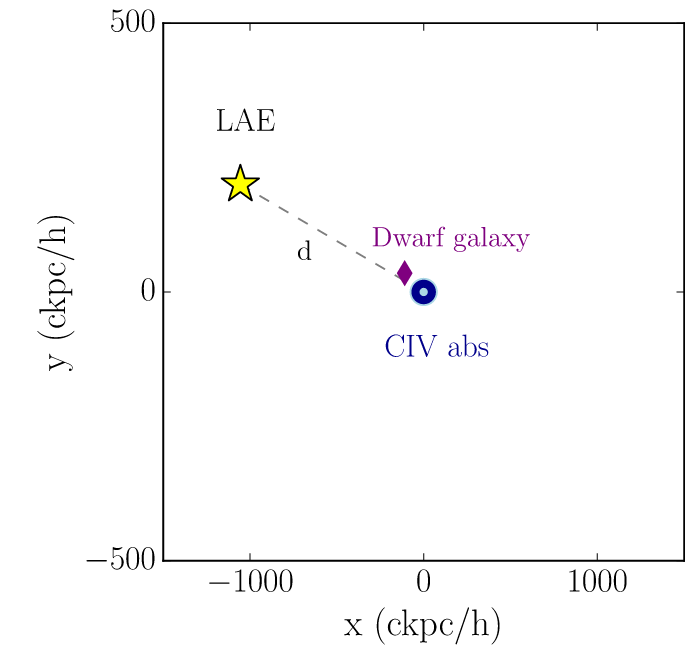 Paired with the result that the LAE could not realistically be the source of the observed CIV, this suggests that the source of the reported CIV system is probably an undetected dwarf galaxy much closer to the CIV than the LAE (the layout resembling that in Figure 2). Further, the authors found a weak negative correlation between the column density, or strength, of an absorber and its distance to the nearest galaxy (see Figure 3). In other words, strong CIV absorbers have a tendency to lie closer to galaxies than weak CIV absorbers. The conclusions of this analysis are that dwarf galaxies are the most likely sources of metals giving rise to absorption in quasar spectra and that, given further study, astronomers may be able to use the metal absorbers in such spectra to study the properties of otherwise unobservable dwarf galaxies.